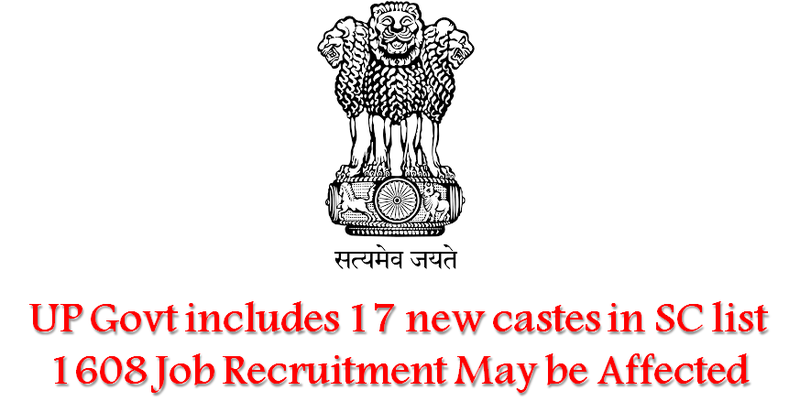 UP government has stretched the SC list by adding 17 OBC castes in it. With this big decision, near about 7200 ongoing recruitment in the State is going to be affected. Uttar Pradesh CM has made a path breaking decision by including 17 Other Backward Classes into SC list. OBCs namely Kahar, Kashyap, Kewat, Nishad, Bind, Bhar, Prajapati, Rajbhar, Batham, Gaur, Tura, Majhi, Mallah, Kumhar, Dheemar and Machua will now get all privilege of SCs. With this decision, selection procedures of near about 7208 ongoing vacancies may be affected. Though no exact official update has been updated by recruiting bodies, still chances are there for a change in the policy. Candidates who haven’t applied yet are suggested to apply at the earliest. Those who have already applied for the post, need not worry and wait for official update to be declared by organisation. It is for the information of candidates that currently, various recruitments are being held in the State. Computer Operator recruitment process is going on at UPSSSC in which 23 posts are reserved for OBCs. UP Police will accept applications till 30 January 2017 against 1478 Firemen posts. Likewise, bank jobs are also open for MBA, PGDM and CA candidates at Cooperative Bank Lucknow. Bank job aspirants can submit their applications before 30 December. Important Note: Candidates are suggested to go through official website for any update regarding change in category wise vacancy breakup. Many fraudulent sites or websites may start spam contents related to this breakthrough decision of UP govt. Candidates are advised to refrain from trusting such contents. For all updates regarding govt jobs in UP, browse our webpage or else bookmark it for future reference.